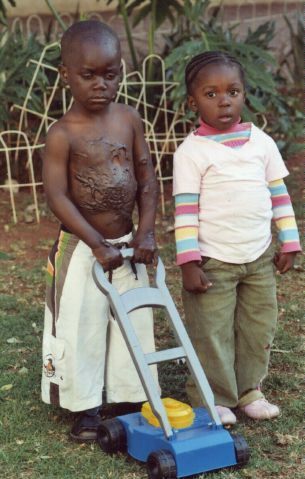 Children of Fire accepts that any measures to create a long term reduction in the fire fatalities and severe burns injuries that occur across the continent can only be done by working with other agencies, collecting reliable statistics (and keeping them up to date), and trying to lessen the problems that lead to the overcrowded squatter settlements and shanty towns in which burns injuries are most common. 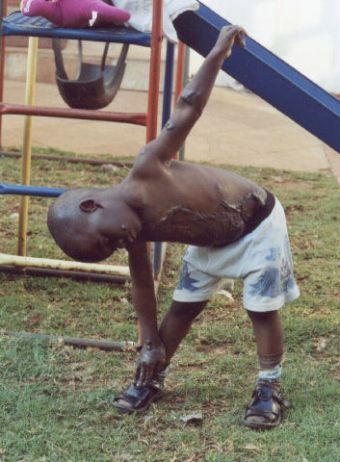 Street children also suffer frequent burns. 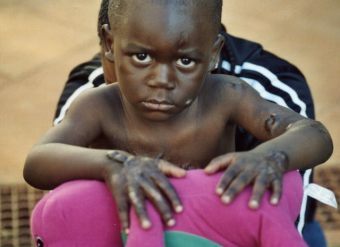 In Johannesburg in July 2000, Children of Fire started links with organisations that try to prevent the children, once high on glue sniffing, from then falling into fires. This section of the website will endeavour to document political and economic moves that have an affect on poverty, health education and prevention of injury. 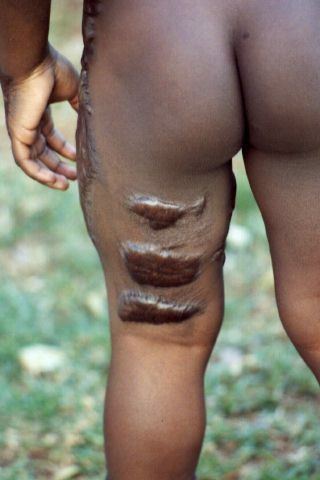 It is the poorest people with the least education and the most children who suffer most burns. The majority of people who are injured were already at risk before the injury occurred. In June 2000 the United Nations teamed up for the first time with world financial institutions to back moves to cut extreme poverty in half over the next 15 years. Developing countries, disappointed by the lack of action following previous pledges told a special session of the U.N. General Assembly in Geneva that it is time to end the rhetoric. The UN.. the International Monetary Fund, the World Bank and the Organisation for Economic Cooperation and Development presented goals for enrollment of all children in primary school and a two-thirds cut in child mortality by 2015. Their joint study, "A Better World for All," marked the first time the four international organisations had worked together to review progress on social issues. The report says poverty rates can be cut in half by 2015 if countries follow policies that reduce social and gender inequalities and create income-earning opportunities for the poor. About 15 heads of state or government, mainly from Africa, attended the summit. A four-day workshop on reproductive health programmes in Africa was held in Accra, Ghana in late June. The workshop was aimed at setting up an African network for developing high quality reproductive health information and services for adolescents on the continent. About 50 participants from 13 African countries attended the forum. Ghana deputy health minister Charles Kpabitey..says that the growing reproductive health needs facing adolescents in Africa pose great challenges to all African governments. He says the increasing cases of unwanted pregnancies, risky child bearing behaviour, backdoor abortions and sexually transmitted diseases among young people have now become development challenges which need to be tackled. World Bank officials say the Bank will soon launch a poverty reduction project that will benefit street children. The new EU-ACP agreement..signed in June 2000, focuses on poverty alleviation and prevention of conflicts within civil society. The 71 Africa, Caribbean and Pacific countries and the 15 European Union countries signed the new partnership agreement in Cotonou. The new agreement, which replaces the previous Lome Convention, also calls for private sector involvement in development strategies, economic and trade co-operation as well as reforms in financial co-operation. Officials say the new agreement will ensure continuous co-operation between the ACP and EU. Meanwhile, Palau Republic, Marshall Islands, Niue Islands, Micronesia Federate States, Cook Islands and Marau Republic are six newcomers joining the ACP/EU arrangement. Kenya has been ranked among those that provide the poorest health services to the public. A World Health Organisation report on the world's health system says Kenya's health care system does not respond to people's needs. Kenyan authorities do not give much emphasis to health, in terms of funding or infrastructure. Kenya is ranked lower than other sub-Sahara African countries that are considered to have poorer economies. Apart from being afflicted by African diseases, Kenyans are also suffering from disorders such as diabetes, high blood pressure and cardiac ailments..because they had acquired a Western lifestyle. Zambia's Health Minister visited the Seychelles in late June. Minister Mpamba was accompanied by Dr Silwamba, director general of the Central Board of Health of Zambia to evaluate the Seychelles health system. Mpamba's visit follows discussions he held with Seychelles health minister, Jacquelin Dugasse at World Health Organisation and SADC Health Ministers meetings. The WHO had actively encouraged African health ministers to visit Seychelles to see how the Health for All principle and the Primary Health Care approach have been successfully implemented. In October 1999 health ministers and senior health officials converged in the Seychelles to attend the 30th Regional Commonwealth Health Ministers Meeting. The Southern African Development Community says Africa's disabled must participate in decision-making processes in their countries... SADC executive secretary Prega Ramsay says people with disabilities should strive to guide the process of establishing policy instruments aimed at addressing their situation... He was addressing the official opening of the strategic workshop of the Southern Africa Federation of the Disabled in Gaborone..Botswana.. in September 2000. Ramsay urged the disabled community in Gaborone to actively participate in discussions revolving around the formulation of legislation and lobby to secure major commitments of SADC governments to adopt policies and practices that befit the disabled.. He says they need to work together to come up with a clear and inclusive strategy that will bring the concerns of the disabled onto the SADC agenda... Ramsay says this must be done because disability is a human rights issue, and SADC is committed to the observance and respect of human rights. A three-day conference was held in Richard's Bay..South Africa in September with about 70 delegates from South Africa's malaria regions and other Southern African countries in attendance... Delegates include doctors, researchers, malaria control specialists and field workers from South Africa, Botswana, Mozambique, Swaziland, Namibia and Zimbabwe... The conference was convened to address the surge of malaria cases in the Southern Africa Development Community region... Malaria is now on the increase with 45 percent more cases in the region over the past year... Conference delegates will discuss the impact of malaria on tourism, the role of research into the disease, management of the epidemic, and the cost of fighting the spread of malaria... In September 2000 ..a British pharmaceutical company announced that a malaria vaccine had been developed and that clinical trials would begin soon in The Gambia. Botswana President Festus Mogae has announced plans for southern Africa's first clinic for children with HIV/AIDS. Mogae says the clinic, the Baylor Children's Clinical Centre for Excellence, is a ten-million dollar public-private sector partnership. It will attend to the primary and speciality medical care needs of HIV infected infants and children. He says the partnership is between the Botswana Ministry of Health, Gaborone's Princess Marina Hospital, Baylor College of Medicine/Texas Children's Hospital in the United States and pharmaceutical giant, Bristol-Myers Squibb's Secure the Future programme. Secure the Future is 100-million dollar commitment to assist women and children infected with HIV/AIDS in Botswana, Lesotho, Namibia, South Africa and Swaziland. The project allows doctors and nurses to be trained in Botswana to manage HIV and its complications in children affected with the virus. Dimanche M came from eastern DRC. 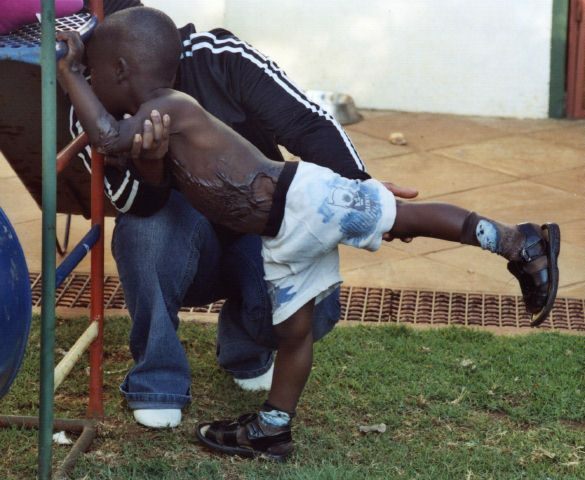 He was intentionally burned in the Democratic Republic of Congo in the civil war that has plagued that country.